They launched Elizabeth and James in 2007, as a brand more reflective of their own personal style, and I guess, giving us a slice of their closet. They also own the hugely successful, couture inspired Ready-To-Wear line, The Row, which they established in 2006. Those two brands, alongside a number of other lines and collaborations, and these girls are truly leading the fashion market with some exceptional and inspiring fashion. 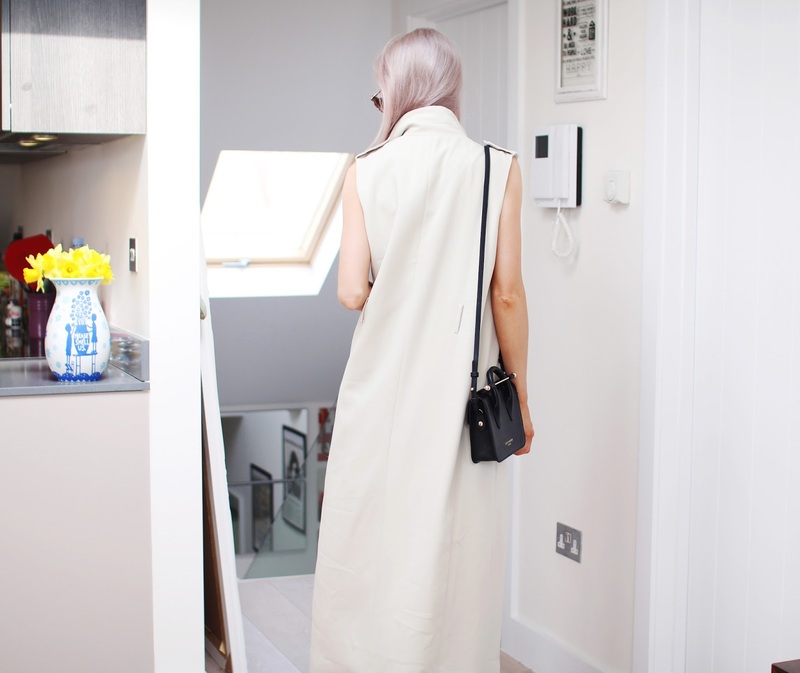 The Row comprises of some absolutely stunning clothing, but their price tags are pretty heavy. Whilst you may like to invest in one of their classic items per year, for most, they are slightly out of reach. Yet Elizabeth and James has a more affordable price point, still not inexpensive mind you, but more along the lines of a very big treat, rather than a bankruptcy case. Yet, I feel that the quality and style of the E&J clothing is comparable to those brands rocking dresses at £1000 a piece, and so I’m totally smitten for it. This dress fits me like a dream – its true to size, and is such an elegant and classy yet party number. Seeing as it was black and neutral, it was only right to bring my Sophia Websters out, and inject that pop of colour. But to keep it sophisticated, I kept the jacket and accessories in the neutrals category and opted for a beige Lavish Alice floor length duster and some cute heart Love frames. That tiny tote is from Strathberry of Scotland, an accessories brand that stocks the cutest leather goods and handbags. You may have seen me sporting a larger pink version in previous posts, but I also got my hands on a tiny black style as well as a slightly larger version, in bright red. And because I know you guys might love them too, you can use the code Inthefrow20 to get yourself 20% off any of the bags that you love for the next week! 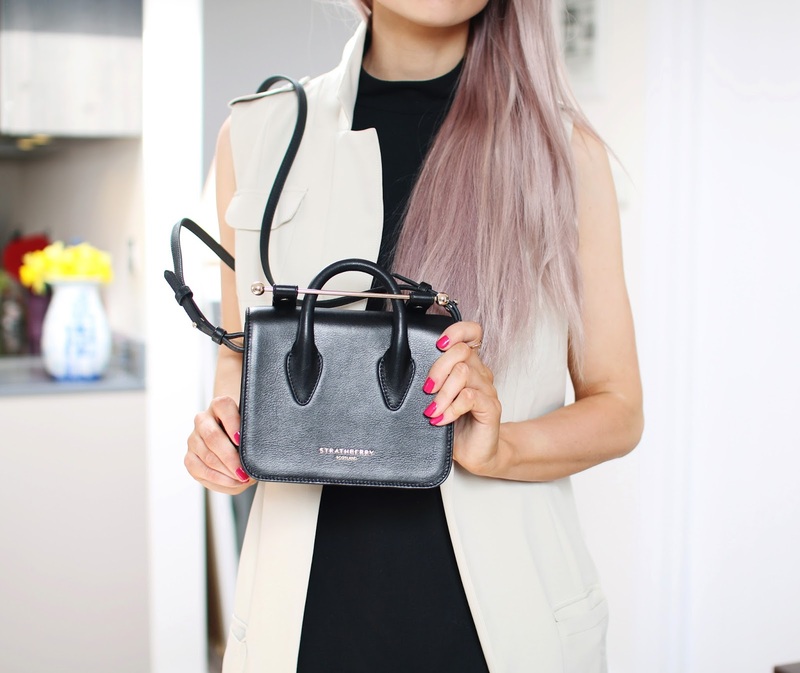 In fact, you can shop the bags that I own, via my own cheeky Inthefrow category on the website! How cool?! If your’e wondering where Id wear this to, think summer evenings in cocktail bars, or outdoors in a roof garden with your best girls or your date. The high neck of the dress, showing all of that leg, it keeps it so chic and classy. Absolutely loving this outfit though. What do you think my lovelies? ?